While foraging through my backyard garden the other day for cucumbers, peppers and hot-to-touch chiles, a slogan occurred to me: "Support Our Troops — Plant a Garden." Gardening was as distant from my life as Afghanistan until I bought a house seven years ago. My newly acquired yard had bluegrass in the middle and a jungle of weeds on the periphery. One year, my neighbors gave me starts of zucchini squash, which they also planted for me. All I had to do was add water. I got squash and then more squash. One would have been sufficient for my tastes. But the squash plants were more attractive than the weeds they replaced, so the next year I planted more squash, green beans and broccoli. These new vegetables similarly kept the weeds at bay with unexpectedly minimal work. I also discovered the immense satisfaction of rustling dinner from my own backyard. My briskly expanding garden now includes green peppers, cucumbers and onions, plus more zucchini than I have friends. Along the way I have also learned that gardens offer stuff for the mind as well as the palate. Every year I am learning what it takes to grow vegetables — just how much sun, how much heat, and just exactly what type of soil. Thankfully, raspberries don’t mind that a previous inhabitant of the house used the backyard as a landfill. Berries do just fine in soil laced with sheet rock. As well, I have been composting all the leaves from my maple tree, plus the daily stream of grapefruit rinds, potato peelings and coffee grounds. Like a miracle, the pile never gets bigger, and by July of every year I have fresh nutrients. Now, from morning to my evening’s repast, all meals include something from the garden. Even in March, I am eating broccoli harvested last July. It both tastes better and saves money. I am tempted to upend my remaining bluegrass and make that soil start pulling its weight. All of this occurs on a 35-foot lot amid a sprawling metropolis of 2.4 million people. It makes me think that the only excuse for the big lots you see across the arid West is the opportunity for creating big gardens. So, how does a digging a garden make me patriotic? Recall that during World War II, a battle of singular motive against fascism and totalitarianism, recycling and gas rationing were matters of patriotism. So was gardening. 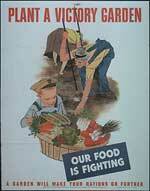 To ensure food for the far-flung troops, people were encouraged to plant "victory gardens." What’s true today is that our country’s agricultural bounty is underwritten by oil. Fertilizers manufactured from petrochemicals explain the spectacular yield of crops. More magnificent yet is our sea-to-shining-sea transportation system. I know of one case where broccoli plants are started from seed in California in spring, replanted in Colorado during summer, then harvested and shipped to Massachusetts to be eaten. And the broccoli is organic. The American harvest starts in Venezuela, Mexico and the Middle East — the sources of our oil. Without oil from abroad, this stunning display of agricultural mobility would be impossible. Extraction of U.S. oil supplies peaked in 1970, and exploitation of the National Arctic Wildlife Refuge would reverse this for only a season or two. Moreover, many experts predict world oil production will peak, perhaps this year, but assuredly during the next decade. When it does, oil will become even more expensive, supplies less assured, and our addiction more desperate. Meanwhile, we’ve delayed pushing alternative fuels and technologies so that they have a long way to go to diminish our reliance on oil and gas, but gardens — they’re here and now. Those of us who have been addicted to things in life (mine was nicotine) understand doing bizarre things to quench our cravings. As a nation, we crave oil and will do desperate things to satisfy it. I propose something more bizarre. Support Our Troops — keep ’em home and become a gardener. Allen Best is a contributor to Writers on the Range, a service of High Country News (hcn.org). He lives and writes in the Denver area of Colorado.